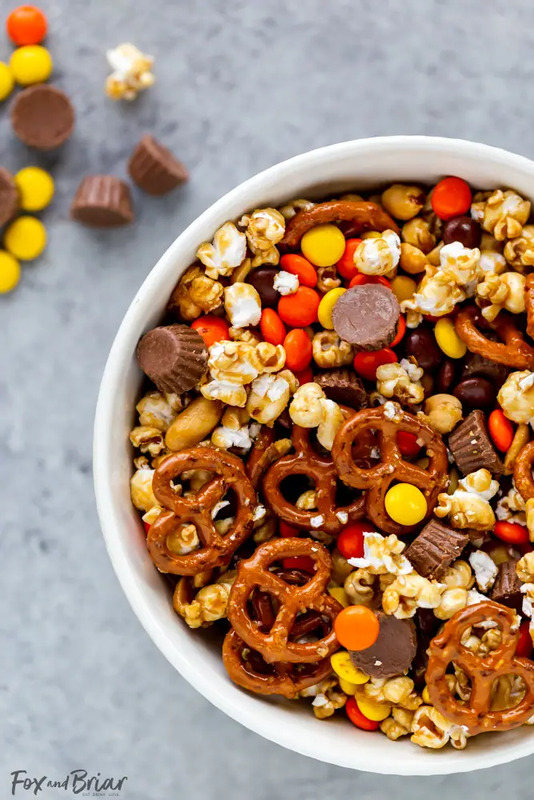 This Chocolate Peanut Butter Sweet and Salty Popcorn Snack Mix is perfect to serve at your next game day party! 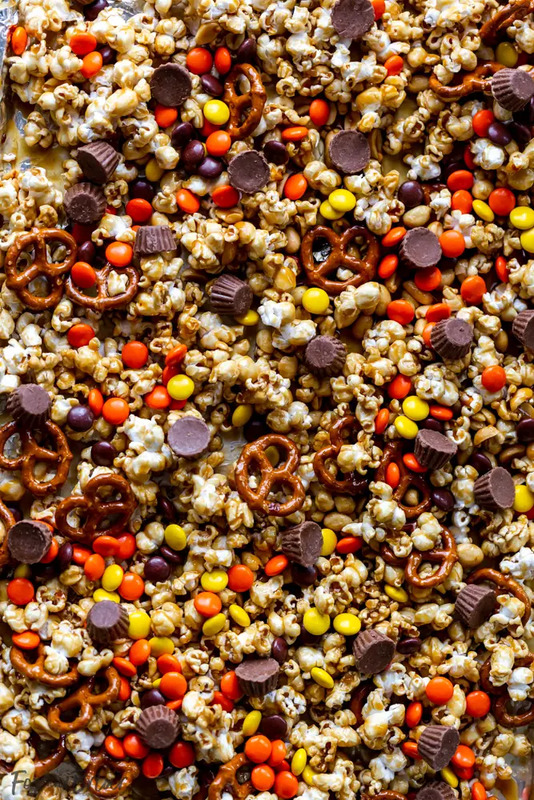 Keep them coming back for more with popcorn mixed with Reese’s Pieces, Reese’s Peanut Butter Cups Minis, pretzels and peanuts, all mixed together with caramel. This post is in sponsorship with Kroger and Reese’s. All opinions expressed on my site are my own. I present to you: Snack Heaven. 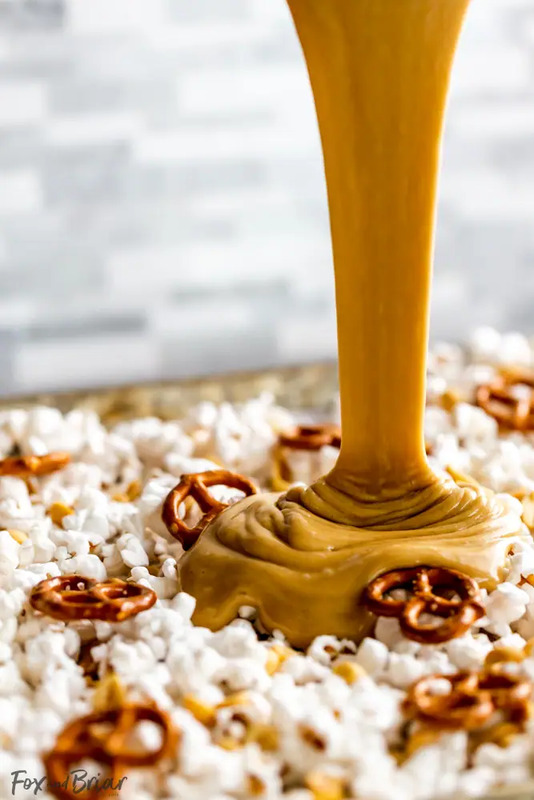 I’ve taken the classic combination of peanut butter and chocolate and mixed them in with some other salty snacks to create Chocolate Peanut Butter Sweet and Salty Popcorn. This is THE SNACK to serve at your March Basketball party. It’s easy to make and it has something for everyone. Being a lover of chocolate and peanut butter, I had to add Reese’s Pieces and the cutest Reese’s Peanut Butter Cup Minis. Of course I grabbed all my ingredients at my Fred Meyer when I was grocery shopping this week. I took the Baby Fox and he charmed everyone in the store, naturally. I’m there shopping at least once a week for groceries, and I love their selection. I was able to grab everything for this recipe, plus all my regular groceries for the week. And they have all of the other game day party essentials! I also prefer the Kroger brand popcorn kernels, which I used for this sweet and salty popcorn snack mix. Check out my post on how to make popcorn on the stove! All of this deliciousness is held together with a quick caramel sauce, then baked for a few minutes. Normally making caramel can be kind of tricky, but I have employed a few tricks here. The first is corn syrup. I know, I normally don’t use it in my recipes. But it really does help make your caramel soft because it helps stop the sugar from crystallizing. The second thing I did differently was use baking soda. Baking soda reacts with the acid in the sugar and foams up, creating bubbles that aerate the caramel. This will help it coat everything better and help if stay soft. Weird, right? Anyway, we could not stop eating this stuff! I had to bag up most of it and send it home with my mom- I knew Mr. Briar and I would eat the whole pan if left to our own devices! You can serve this Sweet and Salty Popcorn Snack Mix in a large bowl or in individual bowls. Which you might want to do so someone doesn’t eat it all! Click HERE to get a coupon for $1 off Reese’s Products! If you love Reese’s, you will love my Chocolate Peanut Butter Cup Coffee Creamer and my Double Double Chocolate Peanut Butter Cookies! This Chocolate Peanut Butter Sweet and Salty Popcorn Snack Mix is perfect to serve at your next game day party! 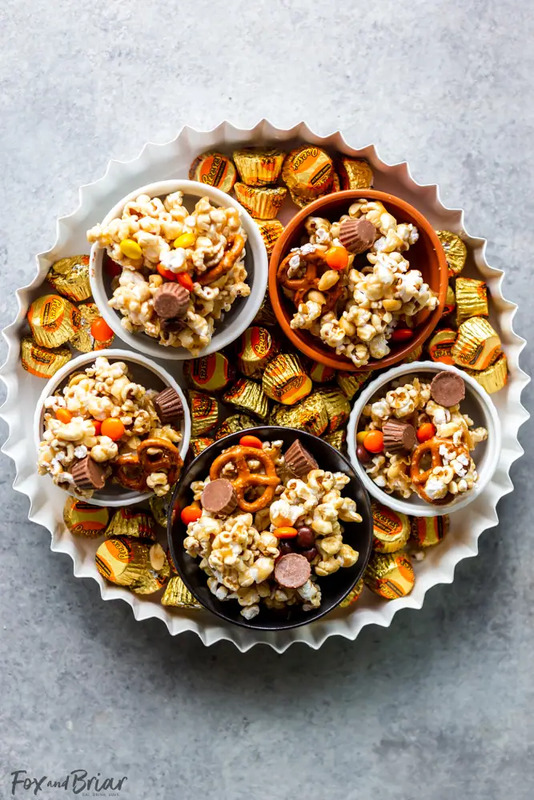 Keep them coming back for more with popcorn mixed with Reese's Pieces, Reese’s Peanut Butter Cups Minis , pretzels and peanuts, all mixed together with caramel. Preheat oven to 350 degrees F. Line a baking sheet with parchment paper or a silicon baking mat. DO NOT use foil. Set aside. Add popcorn, peanuts and pretzels to a large bowl, set aside. In a medium saucepan over medium high heat, melt the butter. Once melted, add the brown sugar and corn syrup. Increase heat to medium high and bring to a boil, stirring often. When mixture reaches a boil, reduce heat to low and allow to simmer for two minutes without stirring. After two minutes, remove from heat and stir in salt and vanilla. Stir in baking soda, and stir until mixture becomes light. Pour over popcorn mixture, quickly stir to coat everything with the caramel. Spread the popcorn mixture on the baking sheet. Bake for 2 minutes, stir the mixture, then bake for two more minutes. Remove and allow to cool. 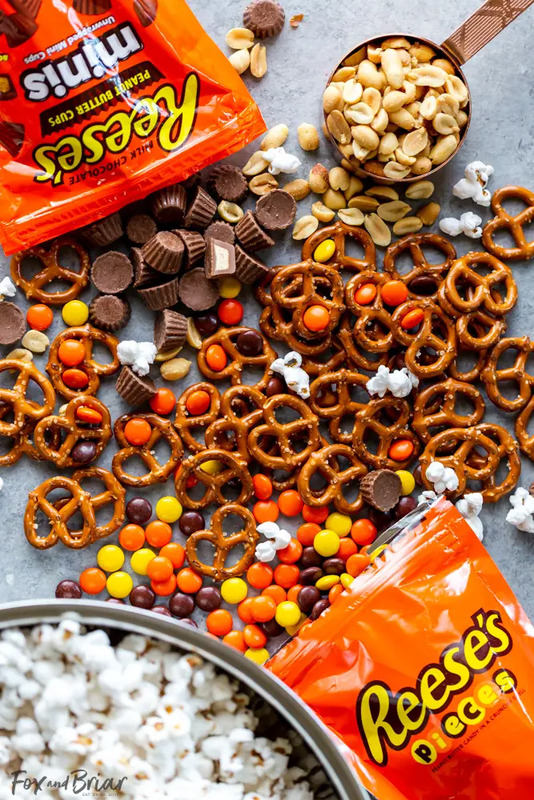 Once cool, add the Reese's Pieces and Reese's Peanut Butter Cups Minis. Break into pieces and serve. Store leftovers in an airtight container. If you want the Reese's Cups to be slightly soft, add while the caramel corn is still slightly warm (but not while it is hot, or the will melt). You can use light brown or dark brown sugar. Light brown sugar will give a more classic caramel taste. OK, that picture of pouring the caramel is INSANE! It looks so, so good!